This article was written on 27 Aug 2018, and is filled under Art Department Resources, Gallery, Past Exhibitions. During the month of August Professor Li and Professor Wang are traveling to Yellowstone and other national parks to paint. The artwork created on the trip will be exhibited in Roberta’s Gallery in the University Center. Excursion: Yellowstone, will be on display from September 6-19 with an opening reception September 6 from 4-6pm. 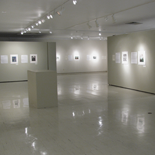 The Crossman Gallery will host an exhibit featuring works by all the visiting artists. As part of the Schuh Visiting Artist Program the gallery will be the site of a series of workshops, demonstrations and rotating displays of new work. The artists will also conduct a series of workshops in Whitewater and nearby areas inviting faculty, students and community members to join them in the field. Please see this poster for information on the Prairie Plein Air opportunity on September 7. The esteemed artists, over the course of their stay, will present illustrated lectures on contemporary and traditional Chinese landscape painting, and provide painting and drawing demonstrations for students and the community. Daily workshops/demonstrations will take place in the Crossman Gallery with open studio time from 5-6:30 pm September 11, 12, 13 and 18. 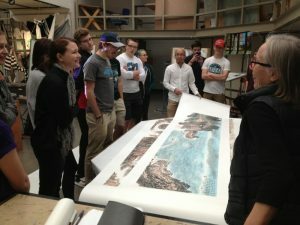 The artists will demonstrate techniques during class with the art students and will also take part in plein air excursions across campus and in the region. This extraordinary visit is funded by the Annette and Dale Schuh Visiting Artist Endowment, that was established in 2015 in honor of the experience Annette (Derge)Schuh had at UW-Whitewater as an undergraduate art student interacting with notable visiting artists. It is with this remarkable donor intent that artists of prominence and significant stature will visit UW-Whitewater on an annual basis. If you have a disability and desire accommodations, please advise us as early as possible. Requests are confidential. The University of Wisconsin-Whitewater provides equal opportunities in employment and programming including Title IX and ADA requirements. Please contact Audra Lange (262) 472-5943 for further information.